This file should be imported in the top-level district account and the StudentID field should be unique within the all the schools of the district. It will be used to find student accounts in all of the schools below the district account. Balances for any and all matching student accounts will be updated to the given amount as of the date of import. The student accounts will be searched using only the StudentID and the student account numbers will be updated to this standard form, Lastname,Firstname-StudentID, so that the account balance can be reflected on each users' login home page. This format file is expected when the merchant action flags in SIP are configured to support the Merchant File Transfer, Merchant PowerSchool Student Interface, and User Account Blance Display. 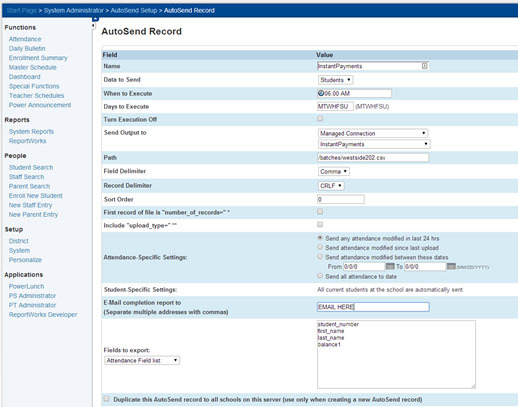 Note that the Simple Account Balances Import Specification will also work for PowerSchool file imports. 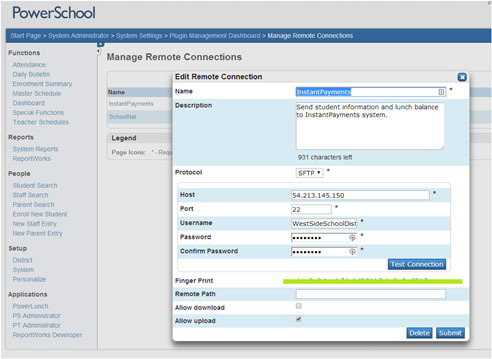 Consult your PowerSchool instructions and setup (districts can also reference PowerSource article 5824) for instructions on setting up managed connections. The following three simple steps illustrate the process.